The RNAO Leadership Award in Nursing Research is awarded to the RN or NP who actively explores innovative ideas in nursing research. This individual enhances the image of nursing by engaging in efforts to disseminate research knowledge, and is in dialogue with RNs, NPs and nursing students to identify nursing research needs. The member has a proven ability to attract research funding and actively participates in the activities of professional organizations. Doris Howell is a dedicated researcher working to help cancer patients improve their health while living with and beyond the disease. Her early research focused on how to help patients navigate the health system, but she's now focused on how to help empower and enable patients to self manage their post-cancer and treatment symptoms early in the course of treatment and post-treatment chronic symptoms. For Doris, her research has always been focused on patients. "It's always been about trying to transform health-care systems toward whole person care," she says. 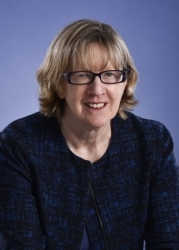 Doris was the first RN to be appointed as a senior scientist for the Ontario Cancer Institute and the first Endowed RBC Chair, Oncology Nursing Research in Canada. She has been published in more than 100 peer reviewed publications, six book chapters, and 32 other publications. She has also given hundreds of presentations in Canada and internationally. In her role as a professor, she developed a graduate oncology elective at the Lawrence S. Bloomberg School of Nursing, University of Toronto, where students learn to use theory and evidence to address common issues associated with cancer treatment.